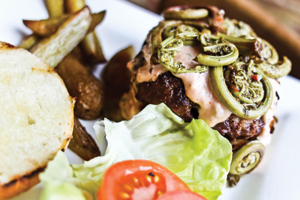 The Fiddlehead Restaurant :: A culinary jewel in the Queen City's crown. A culinary jewel in the Queen City's crown. Growing up as she did in Tokyo with a Malaysian mother and an American father, Mel Chaiken never knew what would turn up in her school lunchbox. One day she’d find a peanut-butter and jelly sandwich. Another day it would be her favorite: onigiri— Japanese rice balls—stuffed with American-style tuna salad. Years later, these East-meets-West childhood experiences would inspire Chaiken’s own creative approach to cooking. Chaiken came to Maine by way of Colby College. Upon graduation, she realized that what she really wanted to be was a chef. She set out on her quest inspired by her mother’s philosophy that you can learn to cook anything regardless of your culinary background. After training at the Asticou Inn in Northeast Harbor among other restaurants, Chaiken became the chef at the New Moon in Bangor. When the New Moon switched to a bar-and-grill menu in 2009, she and her co-worker and friend Laura Albin lost their jobs. So, they decided at the ripe ages of 29 and 30 that it was high time to open their own restaurant. With talent, passion, and plenty of chutzpah, they opened the Fiddlehead Restaurant in the historic Courtyard Building on Hammond Street less than a year later. “We opened this place out of sheer necessity for jobs,” Chaiken said. “We love Bangor, our families are here, and we wanted to stay in the area.” Mind you, this was smack in the middle of the recession in a city not exactly known as a culinary hot spot. The salad was so satisfying that I could have stopped right there, but the salmon was calling me. “We bring a little extra finesse to comfort-style dishes interpreted from cuisines ranging from the Far East to Down East,” the owners note on the restaurant’s website. This I had to see for myself, and so Tom and I headed to Bangor for date night. Albin welcomed us warmly into the cozy space, which emanated an urban-rustic vibe with its exposed-brick walls, black-and-white woodcuts by a local artist, and oak tables adorned with skinny green table runners and fresh flowers. The all-female wait-staff wore black dresses, big dangly earrings, and boots. Mason jars served as water glasses. Chaiken’s East-West childhood influences popped up in appetizers ranging from shrimp tempura with a grilled rice cake to a fois gras PB & J, which featured cashew butter instead of peanut butter and blueberry compote tucked between two slices of rustic bread. “The fois gras is an extra treat,” Chaiken later told me. Tom started with the roasted beet salad, in which the earthy sweetness of beets played against the salty tang of prosciutto atop a bed of immaculate mixed greens sprinkled with creamy goat cheese. A warm bacon vinaigrette may sound redundant (and decadent) for a dish that already contains prosciutto, but it added smoky and tart notes that elevated the salad to something special. The salad was so satisfying that I could have stopped right there, but the salmon was calling me. Pan-seared and dusted with fennel pollen (newsflash: it’s not just for bees), the fish was served over fingerling potatoes and a hash of tiny Maine shrimp and briny olives. Once again, Chaiken brilliantly balanced sweet against salty and brought the whole dish together with a citrus beurre blanc that melded perfectly with the hint of fennel. Generous portions prevail at The Fiddlehead, as Tom found out when he ordered the center-cut pork loin. A lumberjack-sized serving of moist roast pork encased a stuffing of chestnuts and duck sausage, which was nicely complemented by a slightly sweet apple cider reduction and demi-glace. Mashed rutabaga and garlic-sautéed baby bok choy rounded out the autumnal flavors in this hearty entree. We weren’t going to have dessert after such a lush and satisfying dinner, but our server talked us into the “apple pie cup.” This was basically a mini pie made in a ramekin; nicely spiced, it was served with vanilla ice cream. The other desserts on the list were made by several local pastry chefs and featured plenty of chocolate and fresh fruit. As we finished dessert, Tom noticed something interesting. “There are lots of people holding hands in here,” he said. He was right—a twenty-something couple at one table, a fifty-something pair on the other, and two octogenarians at a table of six in the middle of the restaurant. Everyone looked happy and relaxed. In addition to Chaiken’s fresh, creative preparations, which use mostly local meat and produce, what sets The Fiddlehead apart is the care with which the staff tends to the ten or so tables. The attentive service was borderline telepathic, as when the kitchen, without our asking, split the one beet salad between two plates, each of which was beautifully composed. Silverware was cleared after every course, and our leftovers were nicely boxed and hand labeled with the date and contents. The Fiddlehead would give many places in Portland a run for the money in terms of quality, service, creativity, and value. It’s nice to know there’s finally a place in Bangor that’s worth returning to, which we look forward to doing.